View of the vineyards and the Saale valley from Dornburg. Dornburg (map) is a small town in central Germany approximately 250km southwest of Berlin. I’d not heard of the town before until I spotted it in my itinerary to visit Bauhaus sites in Germany – it houses the first Bauhaus ceramics workshop (founded in 1920) which is still operational till this day. I arrived in Dornburg and found a charming town, perched on a hill with lovely views across the Saale valley. The town is filled with rows of colourful houses and at its edge are three distinct castles which overlook the valley. Despite its small size, there’s quite a bit to see in Dornburg and the panoramic views from the castles’ gardens are just stunning. Scroll down to check out what to see in Dornburg, from the houses to the castles and the Bauhaus ceramics workshop. Dornburg can trace its history to around the 10th century. Thanks to its strategic location atop a hill overlooking the Saale River, Dornburg became the site of numerous castles which were (re)built through the centuries. Today, there are three grand-ducal castles which can be visited: Altes Schloss (Old Castle), Neues Schloss or Rokokoschloss (built in Rococo style in the 18th century) and the Renaissanceschloss (17th century). The three castles are connected by beautiful gardens with a promenade. From the promenade, there are gorgeous views across the valley as well as the vine-covered slopes. The ornate Rokokoschloss. This 18th century castle, with its gardens, was visited numerous times by the likes of Goethe. The gardens of the Rokokoschloss. The Altes Schloss (Old Castle) in Dornburg is the oldest of the three castles and was the residence of the Holy Roman Emperors Otto II and Otto III in the 10th century. A promenade links the three castles. There are beautiful views across the Saale valley and the vineyards. The view of the Saale valley. 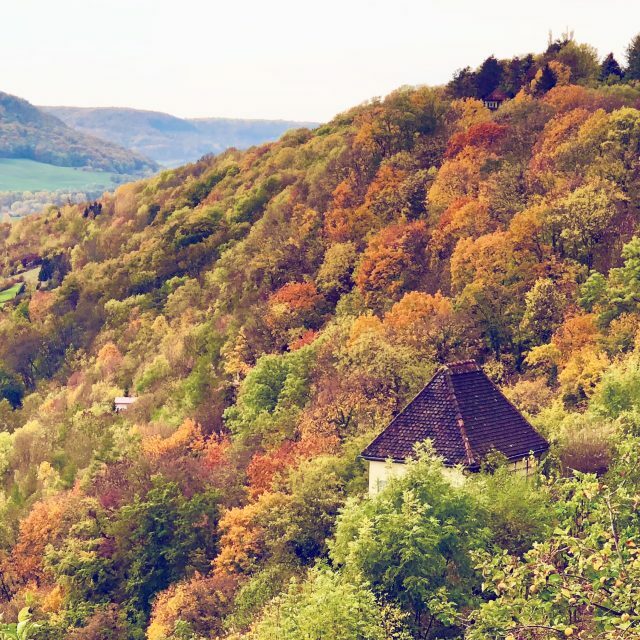 I visited Dornburg in autumn and was treated to gorgeous fall colours. 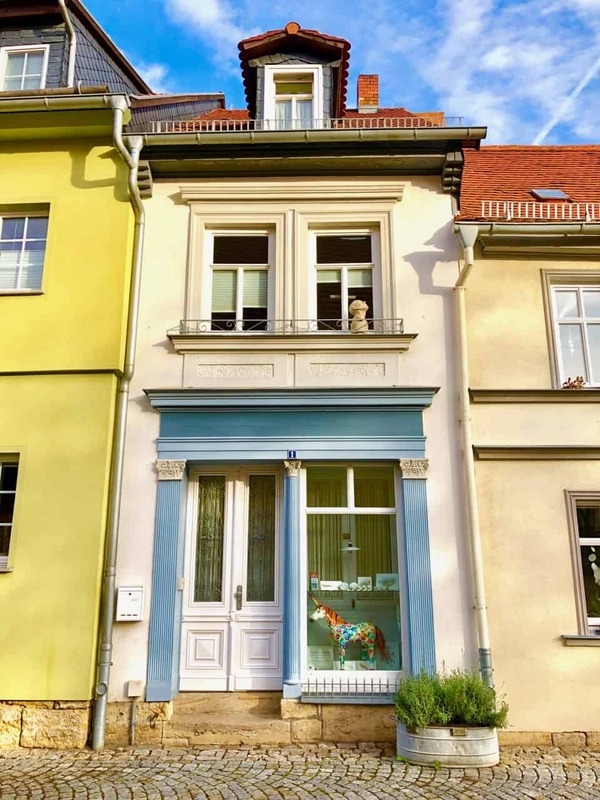 Across from the Rokokoschloss, you’ll find the Bauhaus ceramics workshop which you can visit. 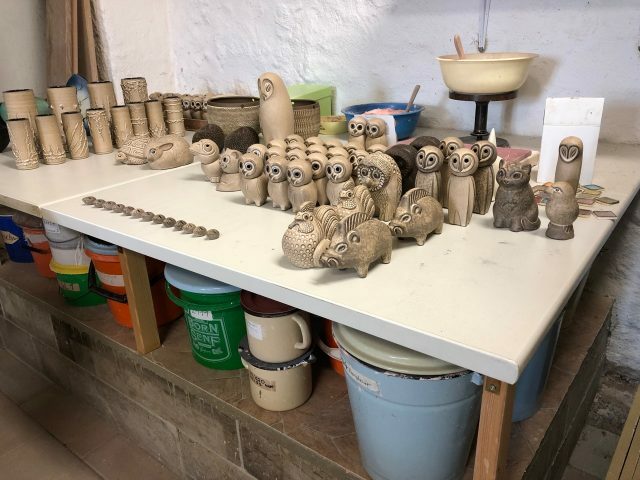 Founded in 1920 by Walter Gropius (founder of the Bauhaus movement) and Max Krehan, this workshop is housed in the castle’s old stables and still produces ceramics till this day. Equipment in the Bauhaus pottery workshop. From here, stroll towards the Markt (market square) in the town centre. You’ll find the St. Jacobs church on one end and the Town Hall (Rathaus) at the other end. In between, you’ll quickly notice the colourful houses that line the square. I loved the bright green and orange houses – they looked so cheery! As I strolled around Dornburg, I found more colourful houses and I had to remind myself that I was, in fact, in central Germany and not in some Mediterranean town! The Rathaus (Town Hall) in Dornburg. There’s a café in the Rathaus where you can have a coffee or a beer. A fountain at the Markt square in front of the Rathaus. I particularly liked this house with a unicorn in the window. Too cute! This green colour just popped! This rainwater pipe featured a dragon! I loved this blue house on top of the hill. There are various cafés and restaurants in the old town where you can have a meal or a drink, such as the Ratskeller (in the Rathaus) or the Hartmut Veit Gaststätte & Pension (where you can have a hearty German meal). If you happen to be in this part of Germany, visiting Jena, Weimar, Erfurt or perhaps Dresden, plan a stop in Dornburg for a leisurely stroll to see its beautiful castles and cheery houses. Note: my trip to Germany was made possible by the German National Tourist Board. As always, all opinions expressed above are mine, and mine only. Great place…didn’t really know much about it. Thanks for sharing.